Tired of traffic jams and exhaust fumes? A recently unveiled design concept for a "straddling bus," which lets cars drive underneath, can not only save road space but also help reduce air pollution. The passenger compartment spans two traffic lanes and sits high above the road surface on a pair of stilts,leaving the road clear for ordinary cars to pass underneath. Regardless of whether the the bus is moving or not, cars under 2 meters high can easily pass through. 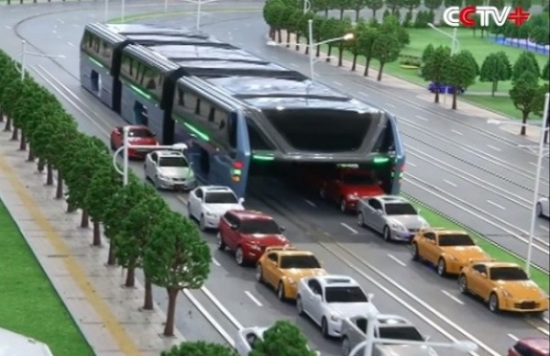 Running along special tracks, the bus can carry up to 1,400 passengers, and travel at a top speed of 60 kilometers per hour.